It seems these days everyone’s got a quick and easy theory on how to price a home, but many are filled with errors that will either cause you to under-price your home, or over price it. Neither is good, because under pricing it means you’re just giving your equity away to the new buyer, and over pricing it means it will sit on the market longer and perhaps never sell. Statistics show that homes that are over-priced tend to sit longer and the seller ends up taking less because the market wonders what is wrong with it when it sat so long. 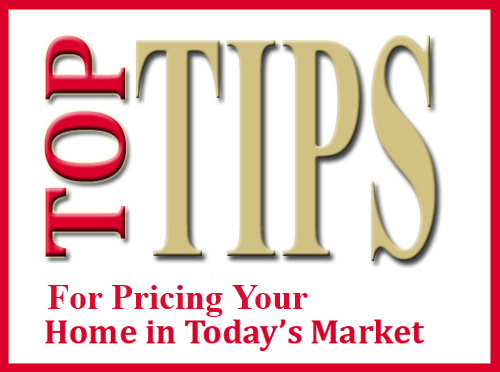 Top Tips for Pricing Your Home in Today’s Market. Don’t go by the property appraiser’s assesses value- I’ve talked to several property appraisers over the years including our own Ken Wilkinson. A property appraiser from IL told me it’s not the property appraiser’s job to value a home correctly, but rather simply it’s their job to value it fairly. There is a big difference. Because property appraisers use a mass appraisal system, they’re trying to price all homes fairly. Obviously if they could price each home at market value that would be wonderful, but they appraise hundreds of thousands at a time without going in the property, so it’s all done in relation to every other property. There can be a wide margin for errors with this system, and thus why there is an appeal process if you believe they’ve made an error. It’s amazing how well they do county-wide, and yet we can’t rely on any one valuation to be absolute. There are variations on many properties. Sites like Zillow provide Estimates. In fact, they call it a Zestimate, but it’s only that, and I’ve seen the valuations vary widely in just a matter of days. They use an online computer model, but again this model doesn’t visit the home, see inside, evaluate the condition, etc. They may look at all homes in a subdivision or street, but here in SW Florida there can be wide variations from street to street. Picture a riverfront home compared to a home 100 ft away across the street, or a golf course lot versus off golf course. Be Wary of Price Per Foot- I could show you two identical 2,000 sq ft homes from a builder. One is built with a pool, the other is not. One is on a waterfront lot, the other not. One upgrades the kitchen, adds a 3rd garage, upgrades carpet, cabinets, etc, and the second remains plain Jane. Obviously the pool and the lot location affect the price per square foot, so the square footage doesn’t really mean much. You could have a home built in 1952 sitting next door to a stupendous home built in 2012 with all the new hurricane protection, wiring, plumbing, roof, etc. Study the Appraisal- Appraisals can be ordered for different reasons. It could be ordered for resell, refinance, estate value, eminent domain, taxation, etc. The scope and purpose can affect the value. If the bank sees you’re a great credit risk, it’s possible a refi appraisal could come out higher than a resale appraisal. Be Careful Valuing Amenities- Just because you put an upgrade in the home 20 years ago doesn’t mean it has much value today. I recall back in the late 1980’s going to a seller’s home on Wren Rd in San Carlos Park. Back at that time homes were selling on that dirt road for $30’s. The seller added a $20,000 pool and expected over $50,000 for that home. It’s true, if you add value to pool cost you would think it would be worth that, but a $22k pool to a $30k home buyer is an extravagant amenity they cannot afford. That’s roughly 50% of the house value which was considered an over-improvement for the area at that time. It’s possible that pool had little to no value in that price range at the time. FHA wouldn’t even give value to a sprinkler system there as it was considered an over improvement. It pays to value a home correctly the first time, as the market has a way of speaking in the end. The sooner you listen to the market, the better off you’ll be. It pays to work with a seasoned agent who can help you price your home using sound methods. On paper you might be able to make it come to what you want, but does that do you any good if a buyer won’t pay that, or a lender won’t lend that much. Be realistic. No matter the market, up, down, or sideways, you will always find those that over price and find a way not to sell. And even in the ugliest of markets’ homes do sell, because sellers price it at today’s value, not some number they need, nor a number from the past. Remember, the market never cares what you need for your home. The market only cares if it’s priced correctly, and if it matches the buyer’s needs. Good luck, and happy home selling. All news is relative. Building permits are up which is good for construction and jobs. While building permits are up from last year, they’re a shell of what they were in the building boom, so you can spin the data any which way you want and we’ve seen it spun both ways recently. Good news for local jobs. For years we’ve talked about statistics and provided updates about what’s going on in the local SW Florida real estate market. Prices go up, prices go down, sales go up, sales go down, etc. All along we’ve said supply and demand will affect the market, but ultimately the real rebound will occur when the economy improves and jobs return to the area. Well, we’ve got some actual good news to report, and while some may spin it and say jobs are not what they used to be back in 2005, I would argue this is good news no matter how you look at it. Nationally, jobless claims rose to 380,000 which was an increase, and this doesn’t even count those who have given up seeking a job, or whom are under-employed. 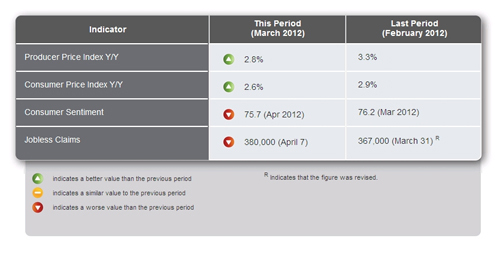 The real estate market has definitely been on the upswing since 2009. For any recovery to be sustainable, jobs have to enter the picture, and now that is happening. As inventory dwindles and more jobs come to the area, there is the potential for more construction opportunities, which fuels more jobs. SW Florida has always been home to service industry jobs and construction, and with the addition of manufacturing companies like Arthrex, it could be a boom to our local economy. There is talk of adding convention center space and perhaps a casino in the Fort Myers area which would also be a boom to the area job wise. Gambling has always been a hotly debated topic and will always have opinions on both sides of the fence. We’ll keep our eye on this however we suspect it will take months for this decision to play out. Foreclosures are down which is another reason prices are up. 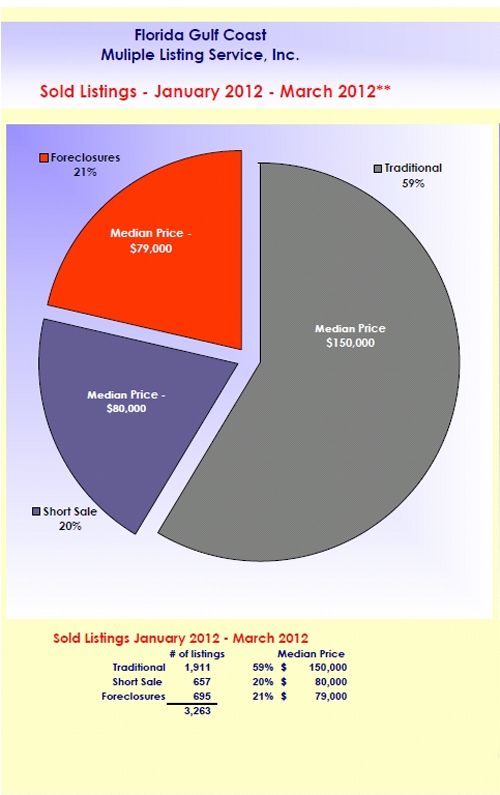 If you look at the attached chart you’ll see the median price of a traditional sale in Lee County Florida is almost double the foreclosure price. This is a function of which homes come on the market in a particular price range, but I think it’s safe to assume that traditional sales are more indicative of actual market values than distressed sales. The good news is, there were almost 600 more traditional single family home sales the 1st qtr of 2012 than there were in 2011. Let’s keep the Good News coming! It’s hard to spin this data as anything but good. In a typical town in anywhere USA, local, state, and national economics dictate real estate demand and prices. Sometimes destination locales and tourist areas forget this fact as some places buck national trends and can do well in a recession and poorly in boom times. Economics Drive Real Estate Markets Too. One could argue it all comes down to economics, and one could argue Florida will always have sunshine and retirees, so we’re immune to such things. I agree that Florida has a lot to offer no matter the economic situation, and I also agree that economics affects us as well. For instance, rentals are doing very well as many people have been foreclosed upon. Foreclosures are synonymous with bad economic times, but it goes deeper than that. People with bad credit are actually helping the rental market, which in turn makes the apartment building worth more. REIT’s (Real Estate Investment Trusts) and insurance companies tend to buy up apartment buildings, and their value is derived from the income they generate, so as rents go up, so do values. This can also affect single family homes, especially in the low to mid end. Upper end homes never rented well enough to support their value, so their value is determined by something else, like appeal, and future price appreciation. This takes us to national economic factors. As Realtors in Florida, we all have access to economic data, and it’s important to look at how this data potentially affects real estate values here. If nobody had a job, it would surely impact housing. All real estate is local, and so is economic data. Today we are looking at national data, because this data affects real estate economies all over the US. Other markets affect us here too. If a snowbird can’t sell their home up North, there’s a chance they can’t or won’t purchase that 2nd home or retirement home in Florida. If their market is in the dumps, or their 401k, they may be less inclined to invest down here, so even though we are insulated from certain events, we can still be affected. Unemployment went down nationwide, but so did payrolls. Many people gave up looking for a job and are not included in the unemployment data. Of course, we also have the under-employed. These are people who have given up on finding a job today they are qualified for and have alternatively taken a lesser job just to scrape by and pay some bills until jobs come back. Average hourly earnings were down. This can be because less workers are full time and more are part-time. It could also be because there is pricing pressure and employers have had to cut salaries, or replace higher paying workers with less experienced and lesser paid employees. Many employers are cutting back on bonuses, benefits, and salaries by furloughing employees in an attempt from laying more off, or shipping jobs overseas. We are in a global economy, and we must compete, or business will cease to exist here in the US. Construction spending is down, as is the average workweek. These are not signs of a revved up economy and definitely a trend we’d like to see reversed. Keep in mind, small changes in numbers equate to big dollars, so it is important we start growing this economy in a sustainable way. All these parts work together, just like real estate markets do. We do not live in an economic or real estate bubble. We are affected, so it’s important we pay attention to what’s going on. We just finished season, and by all accounts it was very successful. Many people from up North bought. Many will come back and buy in the summer or by next year. People loved their visit here. We’re entering the summer months, and an election year. This is the time of year economics matter. Keep your eye on the news. Together we’ll be watching to see if Lee, Collier, and Charlotte Counties can lure some businesses to SW Florida. 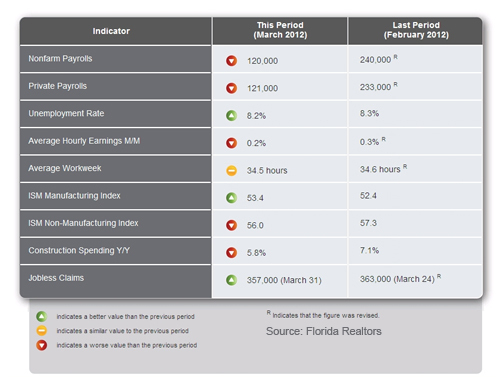 We’ll be looking at Florida employment figures, local construction, and housing numbers. We’ll also be looking at the national scene. We really need about 400,000 new jobs per month to grow the economy. Anything less than that is dragging our economy, and you can see that in March losing jobs did not help us gain 400,000. Economic reports are only a point in time. They go up and unfortunately down. We’re focusing on trends and not blips. We’re praying for positive trends. I think this nation, and particularly SW Florida deserves some good news going forward. Last weekend I was down at Fort Myers Beach taking pictures for our Pinterest site. I was amazed at how many people from all over were enjoying our beautiful beaches. Traffic wasn’t too bad, although practically every car had out of state license plates. This past weekend most seemed to be from Indiana, although there were plates from Kentucky, Ohio, Canada, and many Sunshine State plates as well. Many were enjoying Easter break. There were many college aged people, but also many families. What’s not to love about our beaches? SW Florida boasts some of the best beaches, and certainly the best weather in the country this time of year. In fact, Fort Myers was on the map as the warmest city in the country this past week. 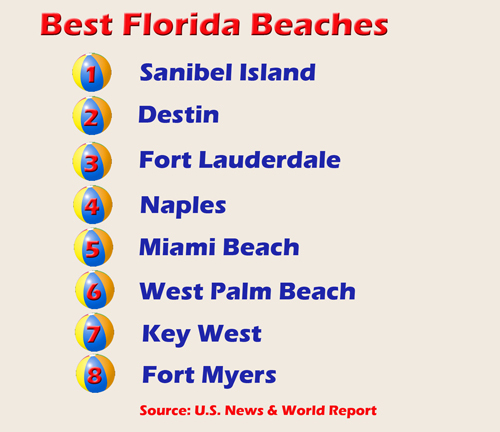 In fact, US News and World Report ranked Fort Myers Beach as the 8th best beach in Florida, and ranked Sanibel Island as the #1 best beach in Florida due to its laid back atmosphere, art galleries, quaint eateries and supreme shelling. 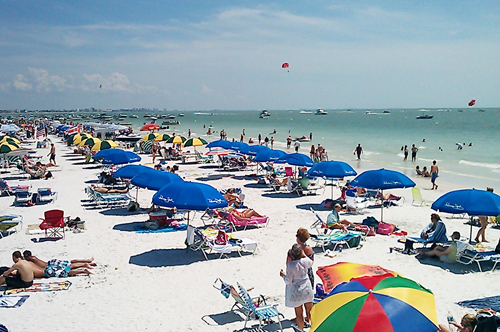 Fort Myers Beach made the list for its small town feel. I really like the wide beach with all the new sand since they’ve completed the beach re-nourishment project. People from all over the world travel here for our beaches and it’s a shame local residents get so busy working and tending to their families that not all get out to enjoy the beauty that SW Florida has to offer. I know having lived in SW Florida for years there were long periods of time I didn’t make it to the beach. It seemed like such a bother to pack up the car, go look for a place to park, find a spot on the beach, not to mention cleaning up all the sand that would inevitably find its way home with me. In the past few years I’ve made getting to the beach a priority recognizing the sand, sun, and water are so relaxing and truly a natural wonder. Perhaps the thing that makes SW Florida so unique is the small town feel, and the beach is no exception. All are welcome here as practically everyone down here in SW Florida is from somewhere else. SW Florida is truly a melting pot. We’ve always attracted people from the Midwest, and in the last decade or so it’s seems we’re attracting more from the Northeast. This could be the natural migration of people coming from the East coast of Florida who have always attracted people from the Northeast, or perhaps it could be the influence of ball teams like the Red Sox. Whatever the reason people visit and enjoy SW Florida, few could argue an area has more to offer than right here. We have world class fishing as many consider us the tarpon fishing capital of the world, top rated beaches, outstanding year round golf, and we’re home to influential innovators like Edison, Firestone, and Ford. Even Al Capone called SW Florida home. Whether you’re looking for a waterfront home where you can park your boat in your backyard, a golf course home, or a condo in a gated community, SW Florida has it all. We even have vacant lots for you to build your life-long dream home. This is the last weekend of season. If you’d like to explore your options on how you could join the party and call the Fort Myers/Cape Coral area home, give us a call or send us a note and we’ll be glad to go over your options and answer your questions. We too moved here years ago and remember what it’s like to have a dream and wonder what’s the best way to make it happen. Once that dream becomes a reality you’ll be telling all your friends how you made it to paradise. Posted in Fort Myers, Fort Myers Real Estate, Southwest Florida Real Estate.